(Bumper sticker image courtesy of Dave Hewey). Thunderhead was a relatively brief, rope tow ski area that operated off of East Broadway in the Riverside section of Haverhill. 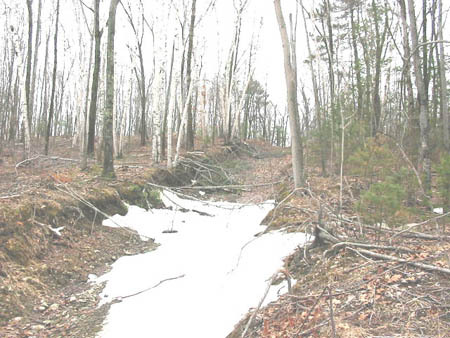 Located just north of the Merrimack River, this area taught many local residents how to ski. Steve Ellis was on the Ski Patrol and gave us some great insight as to the history of this area. It operated no sooner than 1962, with only one trail on the north slope of the hill. The area had nothing to do with the long closed Brandy Brow ski area north of Thunderhead. 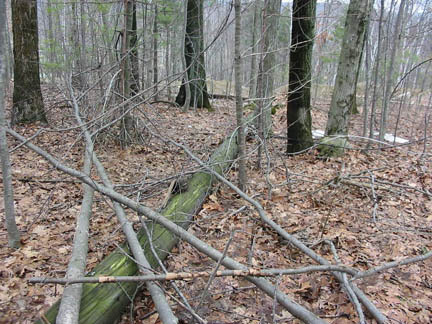 By 1963, the owner, George Merifriedes, added a second trail which left some trees standing, similar to a gladed trail. The area held snow much longer than Ski Bradford which is south of the area by a few miles. 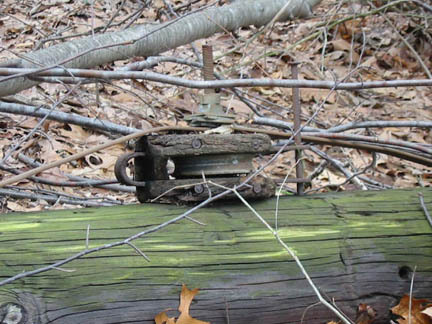 The owner often talked about adding a J-bar or Poma lift but the single rope tow was the only lift ever built. This tow used an old dump truck for power with the rope driven by the dual rear wheels. 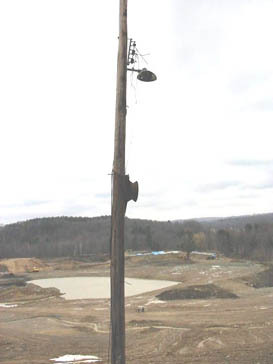 The rope was threaded through a pulley fixed to the underside of the dump truck bed which could be raised or lowered to change the tension of the rope. The safety switches at the top and bottom of the hill would disconnect the truck's ignition. For communication, an old WWII crank phone was used at the top and bottom of the lift. There were grooming machines, rather the ski patrol did it entirely by hand, including shoveling to break up moguls and packing new snow with skis. For this, patrol members were able to ski for free. An old clipping from the area in the 1960's. Bruce Jordan, a patrolman, is shown at the far right. According to David Roche who lived nearby, around 1967, the area closed, as the gravel at the area was more valuable to the owners than the skiing. This gravel was sold, and was used at Logan Airport for the runway extension there in the late 1960's. 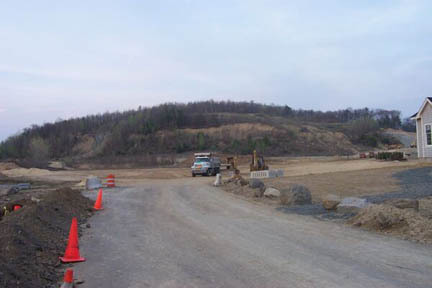 Some gravel was removed at the bottom of the tow and at the opposite side of the hill (south side). Dave Hewey sent us these two maps of the area! This one shows the approximate location of the former ski area. Click on it to see the larger version. This excellent and rare trail map really shows the area! You can see that the rope tow was a Polyethylene Dacron tow. A 3000' trail was also found on the western side, but this seems high given the vertical. Several other wider, cascading slopes can be seen. Note too the warming hut, parking area, and Bunny trail. Click on it to see an easier to read version. Bruce Jordan: There has been some controversy about the location of Thunderhead in Haverhill -"Riverside"-, MA. In the winter of 1964-5 I was the ski patrol there, nights and weekends and I cannot exactly (from my perch in Dallas) pinpoint the exact hill. However, it surely did exist as the attached newspaper clipping above will attest. David Roche: I never skied Thunderhead as I started skiing later in life. 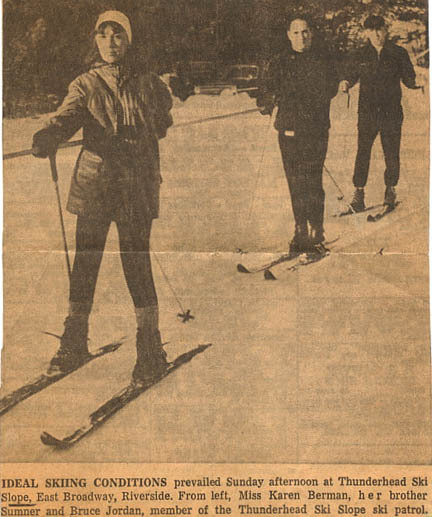 But I was actually on the mountain many times snowshoeing as a young boy. Here are the details I presently know. 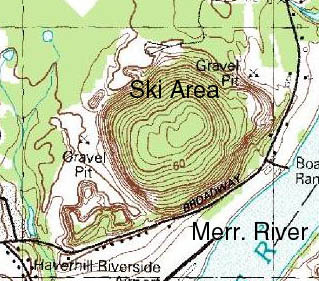 The ski area is/was located off of East Broadway in Haverhill about 3 miles from Brandy Brow. 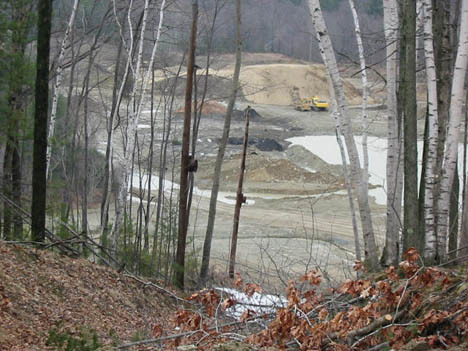 Brandy Brow was an old gravel pit as well as the area that Thunderhead was operated in. The Mavrofrides George and Mark owned the property until about a year ago. As best I can remember Thunderhead ceased operation in 1965 or 1966 when it actually started I will try to find out. I think the reason it stopped operation was that gravel at the time was more valuable than skiing was. When you are Logan airport the gravel that was used to fill in that area came from this gravel pit. The old poles with car rims still stand towards the top of the hill as well as the wooden platform that held the tractor in place to power the rope tow. 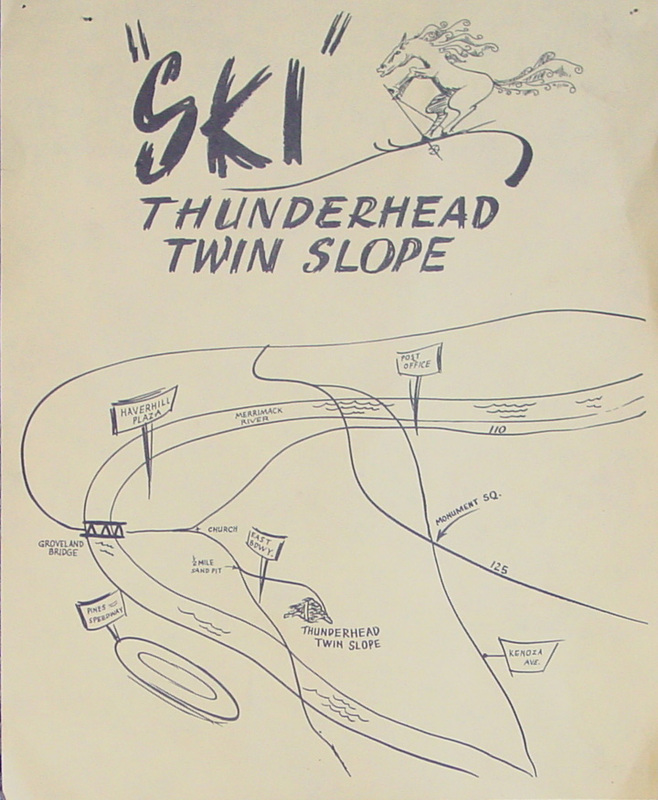 As I remember from the kids who did ski at the time considered Thunderhead a better area to ski than Bradford. And if you where to compare the two areas today with a little thought could see where they were probably correct. 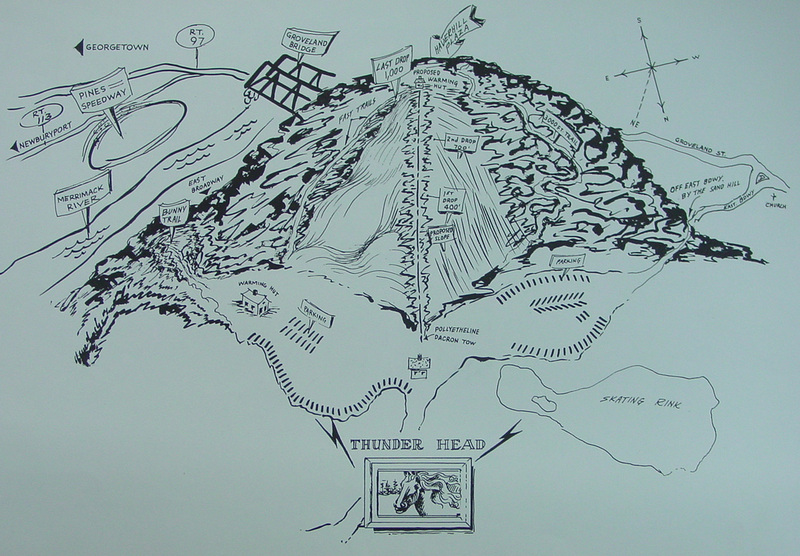 There was a lot more land to develop at Thunderhead than Bradford. So much for foresight by the Mavrofrides brothers. I talked to my Godfather about Thunderhead. Yes there was an area @ Brandy Brow around the time you have listed. When it closed he is not sure. Apparently the area I know as Thunderhead bought/found the old sign from Brandy Brow and erected it at the E. Broadway location around 1961 or so. I do remember this sign. The area behind my house operated until 1967 or so (still trying to find out exactly). I have taken some pictures of this old area and as soon as I get them back will forward them to you. Riverman: I noticed a reference to Thunderhead and if I remember well Thunderhead was in the Riverside area of Haverhill. It was definitely not Brandy Brow. Pummie: It only operated a few years and I think the only lift or lifts were rope tows. For many years there was a sign on a pole right next to the road it was on - East Broadway. Lastrun6 has directions: I don't think there are any signs of Thunderhead left. 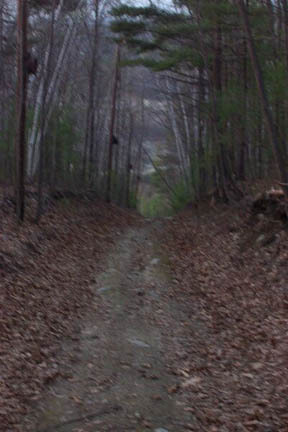 It was located on East Broadway in the Riverside area of Haverhill past Old Ferry Road and over a stream on the left. Once you go past the stream you will see new houses, with a big hill behind them, That's where Thunderhead was located. Lots of the hill was removed for gravel but the top is still intact. So, if anything is left, it would be near the top. A piece of trivia. The China Blossom Restaurant in North Andover MA. (rte 125) used to be called the Charles Steakhouse. When they closed the Charles, the roadside sign to Thunderhead and put a Thunderhead sign over it. Here's a topo map of the area. Thunderhead was on the North side of the hill. Note how close it is to the Merrimack River. An aerial shot before new developments went in. Notice how hard it is to make out the old ski area. Where I believe the rope tow was located is labeled. 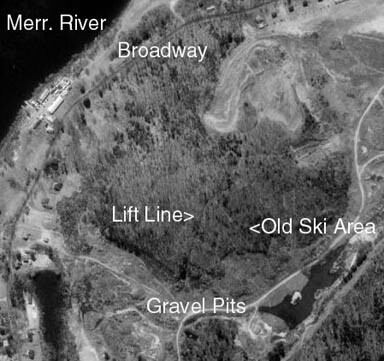 It is possible however, that the arrow for the "Old Ski Area" points to the tow line. 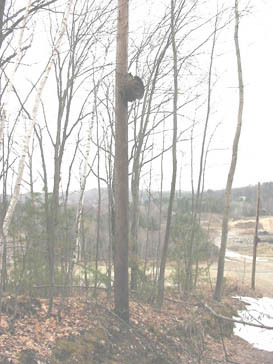 In spring of 2002, Steve Rheaume (Rivercoil) visited the area. Here's a shot of the south slope of the hill. While this is not the slope where the ski area operated, it does indicate some of the housing development going in. Paul Geoghegan (Kayaker) and his wife visited the area on April 2, 2005. According to Paul, the area has a road to the summit. He walked around and took some great photos. First, here's a view of Ski Bradford (looking south from the summit). At the top of the hill, they found a knocked over rope tow tower. On this pole was attached a pulley. This was likely from the return mechanism. 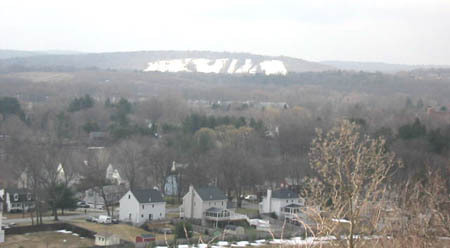 A 2002 view of the rope tow, looking down the north side of the hill. Taken by Steve. Note that the towline was fairly clear. Back to Paul's photos from 2005. This was taken a bit further down the towline. Note how it disappears into the gravel operation. A close-up of one of the bottom towers still standing. The lowest tower still standing with one light still attached. This is over 40 years old! Looking up the rope tow liftline. Notice how grown in any slopes would be on either side of it. The area is currently being developed into a luxury home/golf course area, called the Renaissance Golf Club (link found by Steve Ellis). Parts of the hill will be leveled, and the remnants of the ski area will likely be no more very soon. We are grateful that our NELSAP readers could take the above shots before the area disappears completely.